The critical challenge of extending access to electricity and clean cooking fuels to the poor is deservedly taking center stage in this International Year of Sustainable Energy for All, as proclaimed by the United Nations Secretary General. Governments, members of the development community, and representatives from the private sector are coming together around a goal of universal access to modern energy by 2030. It is ambitious, but there is room to make significant progress that can create opportunity and improve lives. Today, one-quarter of the world’s population lives without electricity, and almost one-half lacks clean cooking fuels, depriving people of vital development opportunities and undermining progress on many of the Millennium Development Goals. Despite intensified efforts at the national and international levels, there remains a significant shortfall in the volume of investment needed to achieve universal energy access. While it will cost $48 billion per year to reach this goal, according to the International Energy Agency, only about $14 billion is available annually. Given the size of this difference, it is clear that the public sector cannot meet the need alone. Leveraging the private sector—both in terms of capital and innovation—will be critical to closing the energy access financing gap. 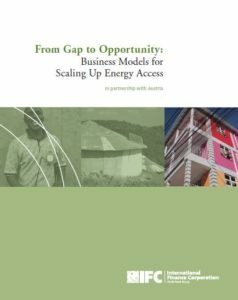 There is another way to look at the challenge: energy access as an opportunity for business. That is the focus of this report.